So after over a year off, I'm back in school. A lot has happened since school has started; let me take your hand. I've actually been enjoying school, probably for the first time in my life. I've never minded school but I don't think I've ever loved it as much as I do right now. Shifting my mindset from wanting to get good grades, to just wanting to learn has changed the way I see things. It takes the pressure off due dates and exams. Instead of telling myself that I need to understand this for X, I can get there the same way through just wanting to understand one more thing than when I started, recursively. It sounds so trivial, but for some reason, it really didn't feel like it. Earlier last month, my mother moved to Asia (nothing bad happened, don't worry!). To avoid thinking about how much I would miss the very same cooking I complained about all the time growing up, I have been spending a lot more time away from "home"— I guess home is relative now. I've fallen in love with coffee shops and quiet corners in the library again. We put on nwHacks 2019. This has been an emotional one. This was my 4th nwHacks and probably my last as an organizer, as we are passing on our hackathon to a very, very promising teammate. It's bittersweet, but mostly sweet because I'm excited to see how our hackathon will evolve. Board game nights. I'm glad those are back. 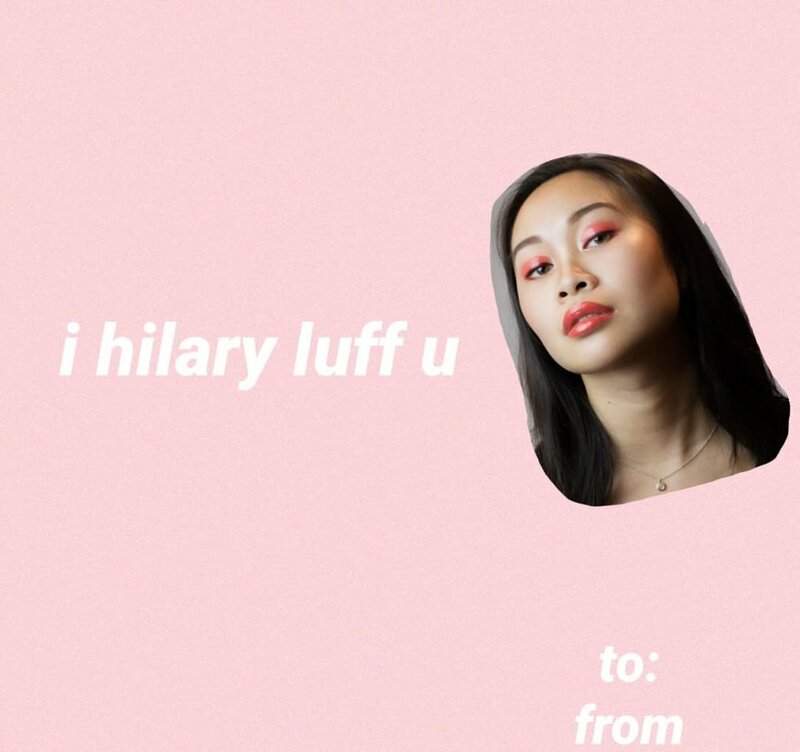 Most recently, I spent Valentine's day photoshopping pictures of my friends for this Valentine's card tradition that we started maybe 5 years ago. We also had hot pot, my true love. My vision was foggy and my cheeks were marinated in tears as I laid down Emily Chang's "Brotopia: Breaking Up the Boys' Club of Silicon Valley" in the ruffles of my blankets. I raced through the book as my blood boiled because once again, I felt frustrated by the culture our industry has fostered. But the last chapter gave me hope. The frustration evolved into inspiration. It highlighted how Stewart Butterfield built Slack as a company with diversity and inclusivity cemented into its core. 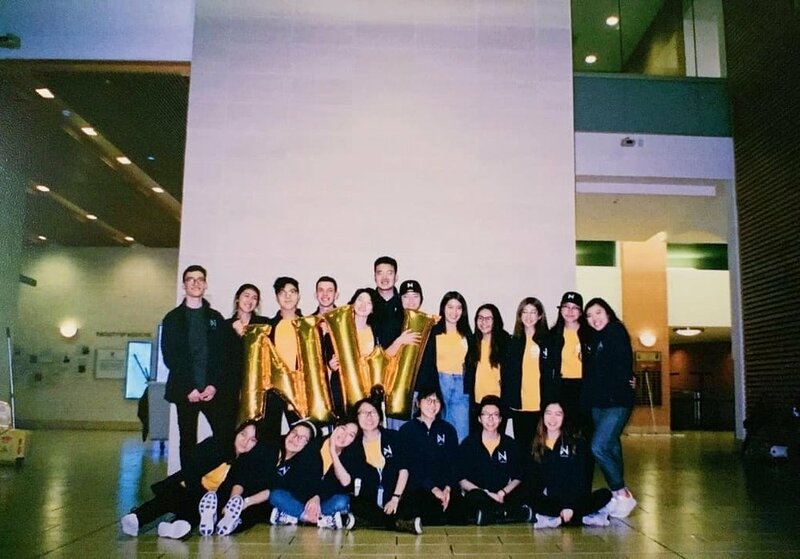 They prioritized growing people instead of the company and evidently, that worked— they successfully did both and are still continuing to do so everyday. I wanted in on the action. Shortly after writing my previous post about my bittersweet parting with San Francisco, I accepted an offer to join the Demo Engineering team as an intern at Slack. The spark of inspiration that I felt in my heart when I read about the company's work culture grew and continued to fill my heart throughout the internship. For Slack of a better phrase, I am in love. Slack is the product of 1) passion for connecting people and 2) great software lodged between 3) intentional culture. It feels silly I had this as the first item because everything after relates to this in one way or another, but it's true. Slack cares about their people and their people care about each other. My mentor called me the week before I started my internship asking me what I was hoping to get out of the internship— not what I can do for Slack, but what Slack can do for me. She gave me the space to communicate what this internship meant for me after I had already accepted the offer in a non-interview setting. I mentioned that I wanted to build upon my software engineering skills, but I wanted to do more than just that. I was interested in building projects end-to-end. From research, writing out product requirement docs, tech specs, building out and deploying my projects, all the way to user adoption. My manager and mentor, both having been through a breadth of different technical roles before, understood what I was looking for and guided me through it. My input was honoured, and I was given the opportunity to fulfill a hybrid role between a software engineer and a PM. Slack meticulously eliminates the overused term of "culture fit". When a company seeks "fit", they will hire people who are exactly like existing employees to fit the mold. Diversity comes from a desire to have someone be an addition to their culture. Foosball, ping pong, serving free dinners at 8pm all encourage employees to stay at work for just a little longer. Work was work— we had fun during work, but work shouldn't permeate into the rest of our lives. When we were at work, we worked hard. But by 5-6pm, the office would be cleared out. Noticing this pattern from my coworkers, my mentor, my manager made me realize that it was important for me to pursue more than just work, which leads me to my next point. Anyone and everyone in Slack could create a channel about something they were passionate about. Consequently, everyone else can join them if they too, were interested in it. There were a lot of active channels. During my time there, I helped kickstart our SF book club. Awestruck by all of this, I started a podcast with a fellow intern— Derek Fang, to chat about what people do outside of work. For me, that included finding my way back to the studio for ballet, aerial silks and yoga after a hiatus. Slack is growing, and rapidly at that, which means that mistakes are bound to happen. There are very transparent conversations both in and outside of Slack about these issues. These dialogues drive the culture of growing from mistakes. You can find examples of this here and here. This applies to both the company and our day-to-day work. I fell in love because of the people. I had the opportunity to pick many brilliant brains through Donut. I love my team— both in Demo Engineering and Solutions Engineering. I love the interns. Because of them, when I think back to this term— I think of string lights that fueled late night conversations, neon signs from diners that painted our faces, roadtrips out of the city while jamming along to mom rock, climbing up Angels Landing with trembling legs and unsteady breath that ended up being my favourite hike (despite my fear of heights), recording songs in the middle of a little living room in the Mission (as a joke 😉), and friends that made me happier that I have been in a very, very long time. That marked the end of my Moleskine, but the beginning of the rest of my journey. Thank you for coming along with me. I'm excited to finally be back in Vancouver and school! I can't wait for the new year. I hope 2018 treated you well, and that 2019 gets even better! 1. Building out a vision is important, but what's next? It's no secret that this event started off as a seed in 2 people's minds. Kristen and I wanted to promote diversity, inclusivity and accessibility within our local tech communities. And I do truly believe that we have made significant strides towards that goal, by bringing students together to discuss and solve problems in these sectors. We invested tremendous amounts of effort and time towards building this, and I don't regret any of it. However, we were tunnel visioned by our own vision and forgot to think about what comes next. What happens when Kristen and I graduate— how could this legacy possibly be carried on, if we didn't proactively pass on the torch on our end? In comes nwPlus and Allison. We expanded our club so there were now dedicated teams bringing in their domain expertise for both LHD and nwHacks, meaning that more people were involved with putting the event together as a whole, and this knowledge and pipeline were being passed on. We also welcomed Allison into our family as a Logistics Coordinator. She wholeheartedly believes in our mission and I believe in hers. Even if Kristen and I hadn't started this event 3 years ago, I have faith that Allison would have. I feel so lucky and honoured to pass on the ins and outs of the hackathon to her while knowing that she will take them with a grain and salt, and always question them if there is room for improvement. For the first time, the behind the scenes of UBC Hacks expanded beyond just Kristen and I, and this is exactly what we were hoping for. The logistics of merging the 2 clubs was easier said than done, and it probably didn't help that Kristen and I had so much ownership over everything we've done prior to the creation of nwPlus. That being said, I do think we have successfully done this now, and it was a lot more seamless than one would probably imagine it being. However, there were definitely small hiccups along the way (which were bound to happen). It was difficult for our sponsorship team to reach out to companies for both LHD and nwHacks. I stepped in and helped move a lot of the LHD sponsors along, while the team worked on nwHacks as the larger event took up more capacity. That was a tradeoff that we needed to make because we have yet to merge our 2 sponsorship packages together, but I think this ended up being a helpful transition in terms of passing on the companies that were re-sponsoring our event to the team. Our dev team was crunched for time and we knew we couldn't finish building the LHD website before registration would have gone live. So I stayed up that night and made a temporary (and admittedly not AMAZING) website for us to put up so that we could at least open registration at the time we intended to, while dev team made our dazzling final website. A part of me felt disappointed about these 2 things, yet, it was exactly times like these where I realized how important it was that we were now part of a larger team. It's so that I have the opportunity to help out however I can, while knowing they would and did do the same when I ran into roadblocks myself. Upon that realization, I started doing things because I wanted to contribute / help, and not because I felt like I had to. This is the same motto that everyone in this club embodies, which brings me to the next point. The day before the event, I drafted up this doc of "Worst Case Scenarios" that we could run into, and what we should do if they actually happened. Let it be known that almost everything on that list happened (mostly related to participants capacity)— but those we already knew how to address, we just needed to execute them. On top of that, our t-shirt orders didn't make it to the event in time, we lost the nametags we had bought, our videographer didn't show up, and the list could probably go on. None of which were within our control, nor drastically augmented the quality of the event, but my heart sank a little more every time I heard about these things. Upon realizing them, our team took immediate action to address them. We got a refund on our late t-shirts and assigned new pick up dates / locations for participants to come in at a different time to receive them. Nick and Lauren went to the store to pick up name tags. A lot of us brought our cameras so we all helped collect video footage from the event. Every time something didn't go exactly as planned, I knew that we would figure it out together, as a team. I am so thankful for every single club member who goes above and beyond to help make our events a success. We had a $500 budget for our top 3 winners this year (along with some in-kind prizes). Knowing that we would have to buy either a gift card or some other gadgets with the money to give out anyway, we just decided to let the participants choose what they wanted to do with their allocated funds instead— with the option to donate the value of their prize to a charity / organization they cared about, or to choose from a list of prizes that equated to the same value. Here was a list of our prizes and our judging rubric, and all 3 winning teams decided to donate their prizes. This is inspiring. The event just wrapped up and I'm already pacing back in forth in my mind about ways we can continuously improve our event for next year, and all the years after that. We will also apply our learnings to nwHacks, which is coming right up on January 26-27! I'm so excited for what's to come and I can't wait to write about this again next year. If you came to the event, I would love to hear how your experience was and what you think we should focus on next year, feel free to schedule a quick chat with me. Onwards and upwards! “I love intense people.” Zach Latta mentioned this to me while we were talking at Hackcon, and that one statement led to staying up all night and eventually watching the sunrise with Kedron and Patrick. Those 4 words have been looping in my mind on repeat since that night. To clarify, when I think of an “intense person”, I think of someone who is so passionate about something (their job, their side project, pottery— you name it) that when you ask them why they do it, they can go on for hours on end because when you love something, there shouldn’t be a formulated and rehearsed answer as to why, you just do. But the most important part is, you don’t have to choose just one thing, and that’s where I went wrong. I’ve contemplated on keeping this writing to myself because I don’t generally publish stuff like this on my blog. I’m a big fan of coherency, which is probably why you’ll find yourself catching a slightly different version of myself on different social media platforms— I actually completely stopped posting on my Instagram account because I felt restricted by the “theme” that I chose for it 3 years ago. Thus, to prevent going down the same rabbit hole, I’ve decided that I should just post whatever I want to on here because it is after all, my blog. 3 years ago, I spent most of my free time in the ballet studio, doing aerial silks or singing with my choir, I also dabbled in writing fictional stories occasionally. 3 years later, I still love all of those things but I don’t do them as often as I would like, and I most certainly never post or talk about them. 1. I found a community of people I love, who share a mutual passion as me— the tech community which I talk and blog about all the time felt like a blessing and a slight curse. I was so happy to have finally found a place within this community, that I would feel bad whenever I spend my time doing things other than personal projects, or hackathons. You see a large portion of my life within this one little website, but I have always refrain from posting about times when I jammed out at the beach with my friends recording covers of songs we loved, or that I finished writing a story that I was finally proud of for the first time in years. That was okay with me because I liked having something to myself but also because of that, I started pursuing these “side gigs” less and less. These passions became something I had to hide from the people around me just to be more distinctly known for doing and loving “my thing”. 2. The fear of not being good enough. Sure, I loved all these things but was I good enough to talk about them? For example, I love taking pictures and recording / editing videos, mostly because I love the story they tell. But I could barely hold up a conversation about the focal length, or ISO of a camera. So was I really into photography? The same thing expands into something as simple as longboarding or baking. I felt this problem long before I was cognizant of it, which probably explains why I get so defensive when someone asks me why I’m minoring in Creative Writing when it has nothing to do with Computer Science, and realistically probably wouldn’t “add” that much to my degree. But I do it because I want to acknowledge and give credit to the creative side of myself, and if getting a minor can drill into my head that it is okay to pursue more than one thing at a time, even if I don’t have 10 years of prior exposure to it, then so be it. At the end of the day, I feel privileged to be able to do all of these things in the first place. But I guess my goal now is to more actually pursue those hobbies more actively, old or new. I’ll start talking about them more publicly so maybe I can even start being a part of active communities beyond just the one. At the very least, I’m hyperaware of what’s holding me back, so hopefully it’s onwards and upwards from here. I’d love to hear about what you’re into, or if you too, are going through something similar. DM me! p.s. 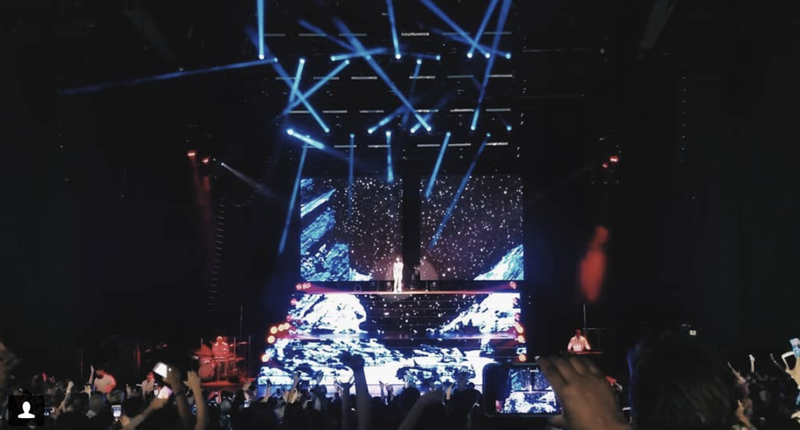 If you want to know why I suddenly sat down and decided to piece all these things together, it’s because I saw Owl City perform live in SF and his passion for creating music really made me feel something. I guess you can say he’s “intense”. I’ve dreamt about moving to San Francisco since the trip I took here for a high school choir competition in Grade 9. I still remember the morning of that trip, I was so anxious to board the plane of my solo journey that I somehow gave myself a stomach flu. But it wasn’t long before I fell in love with the city and its laid-back, yet, rich culture. I opened my heart up to this city and SF found its way right into it. Some emails I sent to my mom from my trip— super cringey emails. I swear I don’t type like that anymore, but that “stylistic writing” sure brought me right back to that time period. So 6 years later, I finally found my way back. I spent my summer at Pinterest learning more than I could have imagined. I kept my days busy with work, nights fun with meet ups and intern open houses, and weekends reserved for my friends and hackathons (usually both). It was scary moving to a new place on my own, who would have known that toilet paper rolls don’t refill themselves? But soon enough, I found myself a couple groups of friends who I did everything with, I still felt homesick at times, but I found my second family here. My fear and loneliness were muffled by love. Had the warmest welcome to San Francisco by attending Twitter’s #DevelopHER camp, which I wrote about here! Stayed in a hostel right in the Tenderloin before moving into my new place, and if you know, you know. I went to my internet-turned-real-life friend’s potluck and met Zoe and Daniel there. Ate the best bread pudding at Tartine Bakery, best rice pudding at Loving Cup and spent too many late nights with a bowl of baklava frozen yogurt from Souvla in one hand, and a can of La Croix in the other. Went to my first Pride Parade and I 👏 was 👏 not 👏 disappointed 👏. Went to meetups that I have been dying to go to since the beginning of time, including SF DevRel, WaffleJS, Lesbians Who Tech, and Sentry Scouts. Listen, these 4 are the most iconic meetups I have ever had the honour of attending. Witnessed apps on my phone work better than they ever have in Vancouver, I’m looking at you, Yelp. Spent my first 4th of July at Mark Zuckerberg’s old hacker house in Palo Alto, where he built Facebook. Breathing the same air that Zuck used to. Took advantage of the free food at every intern open house / festival / hackathon. Huge thank you to the friends who share mutual passions with me in tech, and in food. Shivered from the insanely cold SF summer nights no one warns you about, and the view from Battery Spencer (day) and Twin Peaks (night). Watched School of Rock, Soft Power and Halsey’s concert (preference in that order only because my girl did not sing Roman Holiday). Wondered how I spent my life without knowing René Magritte. SFMOMA, you showed me the light. Stayed up too many long nights losing our sanity over made up board game rules. Spoke on the intern panel at Spectra, which I am so proud of my friends for putting together! Needless to say, I’m not ready to leave. But I guess I won’t ever be. I’ll make the most of my time left here and hang on to the latter half of this bittersweet feeling I’m drowned with, with the constant reminder that this city will always be here when I need it. Most of my traffic sources to charmaineklee.com in the past year have predominantly been through Twitter. So, I really wouldn’t be surprised if that’s how your eyes ended up on this page as well. Why is that though? At one point, Twitter was everyone’s go-to social media platform—I remember this because I didn’t have it, and my best friend would beg me to make an account every single day. So one day, I caved in and made a Twitter account under the handle @misscharmainerockz (carefully chosen by my classmate at the time). All I saw on my timeline were tweets from my friends announcing that they are bored, I followed the pattern for a bit until I decided that Twitter just wasn’t for me. The next day, I deleted my account and skipped happily back to Tumblr. I always loved Tumblr because of the freedom I have on there. I was recently speaking to the PR Manager at my work and she described the platform perfectly, “Tumblr feels like a black hole that you can yell into”. It was true, that’s why I loved it so much. But when I finally gave Twitter a second chance this past year and made what is now @charmaine_klee, I realized that Twitter filled in the gap of a platform like Tumblr (which I love oh so much)—a place where people could not only feel safe to share anything to their little heart’s desire, but also to have their voices heard and amplified. For me, I built a network of support within Tech Twitter. In other words, I found a family on Twitter where I felt more than a CS student from UBC— I was part of something greater, and I belonged. And of course, Twitter always comes through with those fresh memes and exclusive threads. But for others, well, name a platform with something that comes remotely close to Black Twitter, I’ll wait. The camp was a series of ice breakers, workshops, #tern panels, selfie with @jack, lots and lots of delicious food, office tours, networking opportunities, resume revamps and coding challenges. As a hackathon organizer, I’m always on the lookout for fun ice breakers that don’t have everyone in the audience sweating to find 7 “fun facts” about themselves, and I’m pretty sure Twitter’s nailed it this time. So to let my fellow event organizers in on the secret, the ice breaker rolled out in 3 rounds. The first was where we guessed who had more followers between two Twitter accounts, the second was “Name That Song” where we wrote down song names of instrumental tracks they, and the last was “Who D@” where we guessed whose Twitter profile pic was shown on the screen along with their handles (@TheRock, @KingJames were definitely some fun ones). They might be a little Twitter specific, but they’re definitely easy enough to modify to suit any audience. These ice breakers gave us the opportunity to actually get to know each other down to our interests and preferences, and you really couldn't get through the rounds without learning something new while contributing. I loved it! Between the uniquely valuable workshops and panels (I don’t want to spoil anything because I want future #DevelopHER attendees to be as pleasantly surprised as I was going in! ), we also had a lot of fun competing in a series of coding challenges. It was inspiring getting to collaborate with these incredible women, I definitely felt that adrenaline rush from the challenges. As the camp wrapped up, we all bid our farewells to Twitter and hung out for the rest of the night. #DevelopHER was a good one. It was a really good one. I loved everyone I met from there and I can’t wait to see what they all get up to next. If you're a rising Junior, you can (and absolutely should) apply for it here! I interned as a Program Manager at Microsoft's Experimental Projects Division, the Garage. Group pic of all my best friends, aka fellow interns & our fearless leader, Stephane. It’s the feeling of finding those who share mutual passions, those who make you laugh so hard you lose your voice for a week, those who go to the beach at 2am just to lay down and count the stars with you, people who just get it— your people. That feeling came rushing back to me every morning as I stepped foot into our office building. A series of inside jokes and silent chanting of our intern anthem (speaking of which, please listen to it while you read the rest of this post 🙏) laid the foundation of inseparable friendships. And I hope you too, will find your own Microsoft Garage. I just came back from the Microsoft Build Developer Conference 2018, with a ticket so generously gifted to me from the incredible Cloud Developer Advocates team during my internship 🎉 . I went last year too, but this year was really something else. I sat in the audience as they announced the release of 2 AI projects we worked on during our internship— Snip Insights & Mobile Chest X-Ray Analysis. It was heartwarming to see how different teams across Microsoft have also spent the past year revolutionizing the way AI is used in our day to day workflows. But also, tears flew out of my eyes when I saw our faces on the screen credited as the team behind those 2 projects. The early mornings and late nights (not to mention, getting a flood of messages from our manager to go home) we worked have evolved from prime team bonding time, to now, products on the big screen for everyone to try at Build. Our project even made it to TechCrunch! It was at that very moment when I felt like the luckiest person in the world to be able to create such impactful projects. I never want to stop doing this. These past 4 months have probably been one of the greatest experiences in my life. Every day of the internship held a new surprise and we never quite knew what we’d be working on or what challenges might come up, besides the fact that our team would always come out of it stronger. As the only Program Manager intern, I had the pleasure of working across all 4 project teams (Snip Insights, Cloud Chest X-Ray Analysis, HoloLens & Minecraft: Education Edition). This internship wasn’t an easy one. We built out our own prototypes, we sketched our own ever-changing architecture diagrams, threat models and scoped our own features, only to be (constructively) torn apart at our weekly “Dragon’s Den” style pitches to different internal teams. We did over 50 user research and usability testing sessions to continuously iterate on our features and design. We actually went through a 180-degree UI/UX change for Snip Insights 3 days before presenting our project to the CVP of Cloud AI. Needless to say, agile did us well. We passed compliance (accessibility review and testing, privacy reviews, security reviews, global readiness, code analyses, open source release review) by a hair, as we worked until exactly 5:00pm on our last day. And believe me when I say, I will never view products, and accessibility in particular, the same way ever again. I have a LOT more respect for products that go the extra mile to protect users' information, handle localization, and be accessible for all users. This internship was a life-changingly rewarding one. Here are some bonus videos and tweets from our internship that you might enjoy! I laughed. I cried. I laughed until I cried. The last 4 months have been real, @MicrosoftVan! Thank you for everything, @Smmatte. If you too, love turning ideas into real projects, you NEED to check out the Garage. “Finish your TED talk, head straight to the airport, land in Seattle & check into hotel in Bellevue, practice your presentation a few times, sleep, wake up for breakfast with Teresa, give the MVP Summit talk, get dinner with Justin & Teresa, and finally, hop on the plane back to Vancouver at 5am for work at 9am.” That was what I kept iterating to myself over and over again in the past month. Yet, the second I stepped on that stage, all I can think about was how lucky I am to be able to stand exactly where I was. 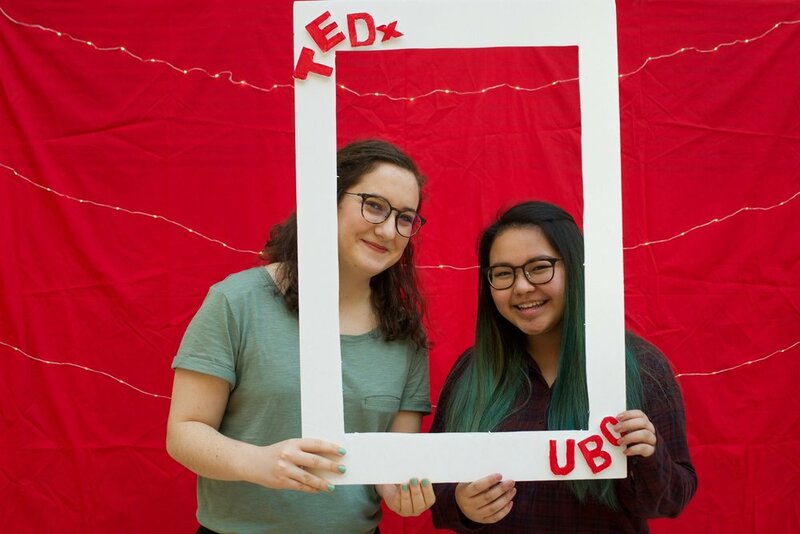 I spent the whole month of February in rehearsals for TEDxUBC— my talk was on Hacking the Glass Ceiling with Neopets. I like to describe the talk as a “That’s what you missed on Glee” version of my life, which for a long time revolved around the virtual pets online game, Neopets. I thought it would be a fun snippet to share because looking back, that game and the people I met through it are the reasons I’m studying Computer Science today. I also bring up topics like open-source software and most importantly, the strengths of diversity and representation along the way. It felt uncomfortable at times sharing moments of my life where I struggled a lot, but at the end of the day, aren’t moments like those the ones that build ideas worth sharing? Sarah is the coolest politics geek ever and we actually hung out again after TEDx ended! So I stormed into UBC on a Saturday with the crew of speakers I’ve made friends with over the past month, and I was in awe of how far all of our talks have come. My thoughts that only existed on little scraps of paper 1 month prior now became a TEDx talk in front of an audience of 500. You can watch the full video of the talk on YouTube. If you’re ever debating speaking at a TED event, let it be known that it’ll be one of the most challenging, yet, rewarding experiences you’ll ever have. So you should just do it. But really, we were debriefing after our talks, and everyone was talking about how they’ve skipped school the past week just to prepare for this. Think: a roller coaster ride that went on for over a month, and finally getting off of it. As soon as I got off that ride, I boarded the flight to Seattle for the MVP Summit. I was invited to speak about Engaging with Student Developers (I presented right after Scott Hanselman on the same stage, my inner fangirl is still not over it) at the summit. Kairui, a fellow student from UC Berkeley and I took the stage together, but let’s not forget everyone who worked so hard backstage— huge thank you to everyone who helped us with the presentation, it may or may not have taken us 5+ tries to finally get the content cleared. Teresa, Justin and Susan not only invited us to speak at the event, but also gave us the opportunity to live like princesses for the days we were there. Molly accommodated our request for a mic check before our presentation— a giveaway that we were amateurs but it also made us feel 10x more confident during the presentation, so thank you! And lastly, shoutout to my boy Kairui who went to the drugstore with me at 1am because I realized I forgot my entire makeup bag at home, and for calming me down about the presentation throughout the past couple of months. The talk went surprisingly well, and we received lots of questions after the session, which means the content must have somehow resonated with them!!! We also got millennial :hearteyes: 😍 as our Twitter feeds were flooded with support from the incredible crowd. We wrapped up our night up by grabbing yet another delicious meal at the Lakehouse with Teresa and Justin. My tummy was filled and so was my heart. So there we have it! I can finally go to sleep without feeling the need to rehearse just “one last time”, and maybe, I can even relive all of this in my dreams. January’s been one long (but fun) month! Somewhere between all of this, I’ve started appreciating music (more specifically musicals) and podcasts a lot more in recent months, as I’ve spent more time commuting to different places. So I figured I could share some of my recommendations with you, listed in no particular order. Lastly, if you're interested, I started a bookshelf of books that I have recently read / am reading. Follow me here! That's it for now! Feel free tweet me any recommendations to add to the list.
" If you know me, you know that UBC Hacks has a very very special place in my heart. UBC Hacks remains one of my favourite projects that I have had the honour to work on, let alone have started, with Kristen 2 years ago. UBC Local Hack Day on December 2nd had 200+ attendees, 20+ sponsors and 35+ submitted projects. At the end of the day, the thing that matters the most is that we were able to provide a safe and supportive environment for everyone to work on their passion projects, even if it was just for one day (for now). It has been an incredible journey and it fills my hearts knowing that our mission for UBC Hacks has gotten clearer over time-- hacking for inclusivity, diversity & accessibility is something Kristen and I have both been wanting to see more of in our community, and all the incredible project demos proved that this hackathon did just that. Another perk of hosting a smaller hackathon is the opportunity to truly bond with your community, I'm grateful for everyone I've had the pleasure to meet through hosting an event like this. Thank you to everyone who has supported us along the way. 💖 Here's to another year of learning and collaborating, to get us one step closer to hacking for a better future. 🎉 " - What I posted on my Facebook, but I have more to say! 1) If you clicked on the word “work” in our description, Work by Rihanna would play. 2) I featured the word “UBC Hacked” backwards as an ASCII art in our source code because I thought that would be funny for those who actually took the time to look at it. Till this day, I’m still unsure if anyone actually found these 2 things, but I’ll continue putting things like these in our future website—I won’t give up on you, easter eggs. Again, Kristen and I tried to organize most of this year’s hackathon alone as we wanted to lay down our vision for UBC Hacks before we passed some of the responsibilities on. Yes, we were tired. But was it worth it? Absolutement! However, we will definitely be recruiting people for our team next year because this really was A LOT of work for 2 people (if they would like to get through this while still leading a healthy lifestyle). We spent all our free time contacting sponsors, and I spent all my lunch times at work hopping on phone calls with lots of ✨incredible✨ people regarding potential partnerships. All my dreams at night were starting to become hackathon related as well, so I guess you could say I was working through the night too. Second time around, we had strategies to handle everything better. We discovered the functionality to schedule social media posts, so I sat down at a coffee shop one night and basically wrote all the posts that you might have seen on our Facebook/Twitter/Instagram page for the past month. My favourite part is definitely when my coworkers asked if I was writing social media posts at work since they were being posted randomly throughout the day. Fortunately, I was still sane enough to know that I wasn’t a Social Media Intern. Scheduled posts and MailChimp were basically the 2 things tucking us into bed each night. In terms of the actual hackathon, saving all of our event statistics from last year and reflecting upon them definitely helped us a lot. o Solution: Our goal of this hackathon was to foster a safe and beginners friendly environment for students to build an inclusive, diverse & accessible local tech community, so we did just that. That was our theme for our hackathon. Having a theme also meant that students had something to grow their idea on, so they could get to the actual hacking faster. Kristen was able to put all of this into our UBC Hacks designs. If you didn’t know Kristen is the Van Gogh of graphic design before, now you know. o Solution: Slack limits members' ability to send more invitations if a large number has been sent but very few have been accepted. This was a problem for us as we tried to mass invite everyone to our Slack, but obviously, not everyone accepted instantly, so we had to contact Slack to uplift the limit. This year, I made use of Slack’s API token and set up this workaround Heroku App for people to request for their own invitations, meaning that they will accept it right away-- keeping our invite acceptance ratios high at all times. BONUS: This app also displayed the total number of users & how many were online! No robots allowed on our Slack 🤖. (Maybe cyborgs). o Solution: We didn’t like the idea of using prizes to buy people’s participation, so we had prizes this year, BUT they were all focused on personal growth (API credits, development tool licenses, free online courses) as opposed to materialistic items—we ended up raffling out some awesome Netgear & Muse hardware goodies to those who demo’d their projects at the end. This was probably one of the best ways to foster a non-competitive environment while still encouraging everyone to share their work. o Solution: The event started at 8:45am, so we served breakfast as well. Don’t worry, it’s not that we didn’t think of this last year, we just didn’t have the budget for it. But this year, we did! o Solution: Bagels, sandwiches and pasta replaced pizzas (we still had some available to upkeep the tradition, but only enough to upkeep the tradition 😉). Since you’ve gotten this far, I’ll share our well-kept secret with you, but only because I deem you as a loyal reader—Pizza Calculator. In all honesty, this year’s hackathon was a big step from last year’s, in more ways than you can probably imagine. To come to think of it, we just finally set up a Business PayPal, so we could actually take in in monetary sponsorships instead of in-kind ones like last year. I am proud of us, but we really couldn’t have done it without our volunteers, sponsors, mentors and of course, participants. Thank you for all those who have supported us, we have you engraved in our hearts. We’re excited to do more with UBC Hacks because of all of you. It was funny that as we inched closer towards exams season, the distribution of our email responses skewed later into the night as well. Our relative contributions to our 13933 messages. In addition, after parsing through our messages, I was able to calculate word frequencies in our chat log and generate a word cloud based on it. 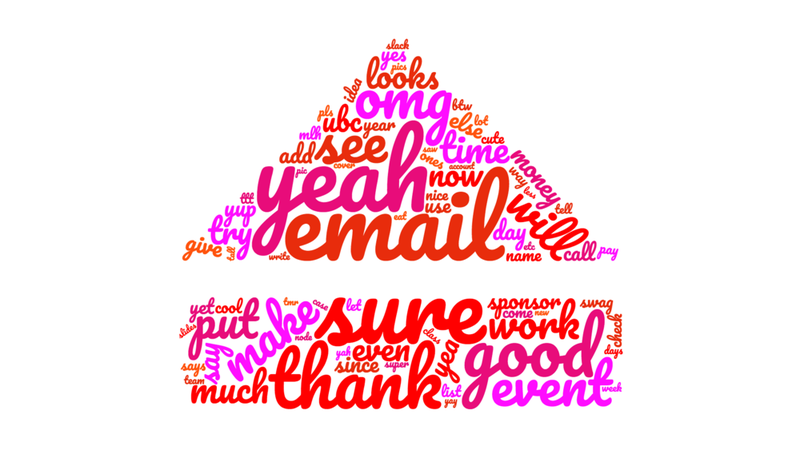 In the past month, your chances of getting an instant response from me through email was definitely higher than if you were to message me through any other platform, so I guess this word cloud accurately reflected that. Here is my infographic attempt at capturing some statistics of our 399 registered attendees. It was exciting to see a larger representation of females & non-binary students at the event this year! We hope to continue inspiring and impacting the community with events like Local Hack Day, and we hope our attendees' work towards a more inclusive and accessible tech community doesn't stop here either. It’s been a while since I’ve written and I think this post justified some of that, but in case you’ve been losing sleep over my lack of updates (says no one ever), here is an additional snippet of my past 2 months. I’ve had the opportunity to attend Grace Hopper Conference, explore and hack in Seattle during DubHacks, organized MSP Summit, volunteered with GIRLsmarts4tech, made lasting friendships at and wrote about SAP iXp summit, received a scholarship to attend Women in Tech: A Fireside Chat, all while Hacktoberfest was happening, where my InternetWishlist repo got some new contributions! If any of those peak your interest, then feel free to check out my Twitter or shoot me a message, I’d love to chat. Otherwise, I hope you at least enjoyed this post about one of my favourite days of the year and all that led up to it! You can find UBC Hacks' Local Hack Day 2017's Facebook event is here, pictures from the event here & project submissions here. One of my main goals for this school year is to explore my passions and to better prioritize my time based on the value I see in different things. I have the momentum to do almost everything that I want to at the moment, but this momentum might not last forever so I’ll take advantage of this while I still can. 1) I started my internship at SAP! I just started as a Full-Stack Developer Intern at SAP. I am on the SAP Jam team, working on our very own enterprise social collaboration platform. Beyond the beautiful office and the free coffee ☕️, what makes this internship special is the Internship Experience Project. This program recognizes value beyond the work you do at SAP. It gives you the opportunity to easily schedule 1:1 with company executives, matches you up with a compatible mentor and regularly hosts intern social and networking events (including hackathons, conferences and summits)! I’m excited to see what’s in store for my next few months here. Hack the North never disappoints. As a community who is constantly pushing the boundaries of hackathons, I feel honoured to have been a part of this incredible event for the second year in a row. From Justin Trudeau, our Prime Minister kicking off the hackathon to late night poutine and beavertails, Hack the North took one big step for growing the Canadian / global hacker community. There were lots of different meet ups happening to celebrate the diversity of students showing up at Hack the North. I also had the opportunity to sit in on the Diversity & Inclusion Panel held by Tracy Chou, Jennifer Dewalt and Cat Noone. It was one of the best Q&A panels I’ve participated in. My teammates (Daniel, Payton and Chetan) are the best. This team reminded me of why I fell in love with hackathons in the first place. They were so kind. Their sense of humour and sarcasm was what got me through the nights. My favourite part was definitely the night before submission time— one of my teammates was determined to get the Spotify API working before he slept, but the rest of us were prepared to slip into dreamland. Instead of just going to sleep, we all stayed up to cheer him on because we knew how much it meant to him. It was humbling to have worked on JukeBAUX with them. I had the opportunity to visit the Slack office with Women Who Code Vancouver. Brenda Jin, Roo Harrigan and Jen Long from Slack SF spoke about their journeys through the tech field, and we even got to see some live coding from Roo! The sense of joy I felt after the event made me realize how much I loved the community of women that I’ve successfully surrounded myself with. That's all for now, I'll keep you posted on what I get up to next! Until next time! I spent the summer as a Software Developer Intern at the SIOLab— a Digital Catalyst Lab thriving in between the Strategy and Innovation Office's startup culture and the purpose of transforming pediatric health care within BC Children's Hospital. Oh wait. This isn't Slack. A "Turkish" Delight. A backend cyborg. A tinkerbell with magical designer dust. An analytics wizard. An analytics wizard intern who couldn't turn down a good Game of Thrones debate. The boss who had 2 masters and an extra one in sarcasm. And there I was, wondering how I got this lucky to have the opportunity to work amongst them. On my first day of work, I went home and told my mom that this place would be hard to leave behind. On my third day of work, I changed my mind. I jokingly typed "sudo rm -rf", but ended up accidentally actually destroying the VM (thankfully) I was working on. I was so angry and disappointed in myself. But my manager told me that everybody makes mistakes-- he refused to think less of me or my skills as a developer because of the mistake. I needed to hear this. I needed to know that someone believed in me enough to encourage mistakes for my own personal growth. This one sentence left an impact on me. I went home and told my mom that this place would be impossible to leave behind. On my last day of work, I look back at one of the best summers I’ve ever had and I’m completely speechless about this whole experience. I’ve dug up my passions by working and falling in love with PWAs— the allergy symptom checker app I was working on had its beta released, but I can’t wait for it be released to the public! I felt like a proud mother as I watched and helped transform mockups to first a working front end (Angular 4, Ionic 3 & Cordova), then to implementing a backend in PHP (Laravel) with a MySQL database, and finally seeding data and testing the application thoroughly. In addition, I was given the opportunity to extend my interests as a Hobbyist Game Developer to developing an HoloLens application that combines slices of patients’ MRI scans into a 3D model to provide holistic visualizations and analysis of a patient's brain in Augmented Reality. I also spent some of my time playing with Data Analytics and Machine Learning (Python & R). So workwise, I felt fulfilled. I saw the impact of the work I was doing, all while learning and discovering new things every moment of the day. However, that experience could be gained anywhere (well, maybe— considering how diverse the tasks I was given were, but they really do adjust your work according to your interests to the best of their abilities). But what I couldn’t have learnt anywhere else was the importance of dynamic within a team. It’s impossible to explain my work family but it all boiled down to the fact that we valued each other, we respected each other, and we were constantly learning but also challenging each other. And in a blink of an eye, my 4 month internship was over. Sooo... to upkeep my title as the intern who sang one (or ten) too many musicals at work, I'll summarize my internship and this post with a song from my favourite musical, Wicked. We spent a day working in separate areas, so we decided to communicate by sticking our heads out the window. We laughed for 3 hours about these 2 pictures. You had to be there. Not everyone knows why you can’t hang out every weekend. Not everyone understands why you travel from place to place to attend hackathons. Not everyone cares about the new VR project you’ve built on the Vive. But you do, and you want everyone around you to too. So you take on the initiative to make your own hackathon and grown your own local hacker community. You hope that your passion and joy can be felt by those closest to you too. That’s the journey that most hackathon organizers go through. Organizing a hackathon is tough. So when Hackcon puts 400 students who have been through the same journey in one room, everyone becomes instant friends. By the end of the 3 days, you know everything about each other’s hackathons, favourite programming languages, and not to mention, Resistance tactics. The conference was held at Pocono Springs Camp, a beautiful (& super clean!) campsite where you can swim, kayak, zipline, you name it— they probably have it. This venue was by far the most unique conference venue I have ever been to. By putting us all in one isolated campsite, we were given the opportunity to truly bond and focus on what mattered to us. This conference was definitely made with inclusivity & diversity in mind. From the gender pronouns on our name badges to the talks, the environment kept us feeling safe and comfortable at all times. Most of the talks I attended were discussion-based. This was valuable as it was interesting to hear about everyone’s unique experiences, and how we overcame similar challenges in different ways. I loved that everyone was there to learn and share. Everyone’s passion for the growth of the hackathon community was so inspiring and I was constantly reminded that “A candle loses nothing by lighting another candle”. Individually, we can build great things, but together, we can build the future. I also loved how the topics were well catered specifically to organizers, I was pleasantly surprised by discussions like dynamics between co-directors and how to leverage different communities. These were topics that aren't usually discussed within the attendees community, but heavily impact the core of an organizer's role. Here are some of my favourite sessions by Victor & Chi, Lizzie and Kaitlyn (Madi, Joe, Swift & Kim’s + more are also part of this list but their slides / presentations aren’t up yet. I will link them once they are)! The workshops generally ended before dinner so any time after that was free time. Li organized a Ladies Storm Hackathons meet up at the campfire. We made delicious s’mores and had a great chat. I was also able to catch up with a bunch of friends that I have met over the past year at different hackathons. We ended up playing board games and Resistance until 2am. Our laughter filled every moment of silence in the night. Just like that, Hackcon flew by. Before I knew it, I was leaving the campsite with new friends, memories, ideas, and the most adorable Octocat plushie. At the end of the day, the growth of this community is the growth of the people in it. So what better way to celebrate this than by gathering all of us together? The crowd was muffled by the sound of “Empire State of Mind” by Alicia Keys blasting in my headphones. I looked around and took a deep breath. I couldn’t help but let out a smile in disbelief. Time was frozen and I, was in New York. Somewhere between attending hackathons, conferences and visiting my best friend around the world this year, I found myself slowly becoming numb to the excitement of travelling. Something that I once eagerly counted down the days to, became second nature to me. I think a large part of why this came to be was because I realized the location of where I was never mattered, what I was doing did. But the bustling city that never sleeps took me by surprise. The excitement of travelling came rushing back to me. It’s been a week since I came back from my trip, but not a day goes by without me daydreaming about it. I spent my first night in NYC walking around Time Square. My partner in crime, Shreya, and I checked out The VOID (Please check this out if you're into VR! Huge shoutout to my work for gifting me these tickets before I left! <3) and later on met up with some friends. We were all perfectly content with the aimless wandering, as the flashing billboards and lights blinked well past midnight. I wanted to keep exploring, but eventually, everyone got tired so we headed back to our hotel. We tucked ourselves in and I stared at the ceiling until I finally got used to the light pollution. The next morning came around and we headed to Wall Street to meet the famous Charging Bull and Fearless Girl, but in return, we were greeted by the rain. So we quickly headed to SoHo and seated ourselves at a cozy Italian restaurant. A few hours went by and we found ourselves at the Rockefeller Centre, but the view was obstructed by the rain and fog. Therefore, we were encouraged to go back the next day. We then visited our friends at Major League Hacking and Spotify. Both of those offices were very welcoming, and catching the Behind-the-scenes of 2 companies that I adore so much was such an honour. Shreya and I parted ways shortly after as I headed to the Gershwin Theatre to watch Wicked. Watching Wicked on Broadway has been on the top of my bucket list since I sang Defying Gravity for my choir in Grade 8. Shreya had to meet up with her friends that evening, so I ended up going alone. It was the most heartwarming musical my eyes had ever laid eyes on, and it truly earned its spot on my bucket list. I’ll be keeping it on the list for a while longer because watching it once was no where near enough. I hung around Times Square for the rest of the night. I snatched some souvenirs and tried Shake Shack for the first time. I met Shreya back at our hotel room, we jammed to some music and shared some snacks as we Skyped her boyfriend. We woke up early the next morning and met our friend at the Facebook office. He invited us there for breakfast and told us to come with a very empty stomach. We were lucky we did because their breakfast was a full on buffet. He then showed us around the office and snapped tons of hilarious shots of us. We then revisited the Rockefeller Centre and the view up there was jaw-dropping. Being able to stare at the Empire State Building from this distance felt surreal. Central Park was our next stop. We sat around for half an hour and decided that we would walk around some more. So we grabbed Joe & The Juice and proceeded to shop around together. It was a sweet ending to an unforgettable trip. Left our mark on the Facebook NY Wall! I’m currently in a love-hate relationship with this city. It treated me sooo well but now I’m left with a bad case of wanderlust. New York, I promise I’ll be back for you. I’ve been putting off this post ever since the conference ended because I knew that no matter what I wrote, I wouldn’t be able to do the event justice. However, not writing about it would be even worse. So, here goes! My friend, whom I met at Pearl Hacks, Sabrina and I were both lucky enough to have received scholarships to the Microsoft Build Developer Conference. Therefore, we ended up booking our flights to arrive and leave Seattle at the exact time to split those Uber rides and of course, be roommates. The moment I saw her at the luggage carousel, I already knew that this was going to be a trip to remember (partially because we screamed and dramatically ran into a hug from 10 ft away). We ended up checking in at the Hilton and headed to the Convention Centre. We were welcomed with huge swag bags, a conference badge and lots of optional pins to put on the lanyard. We then went to the pre-conference student event where we participated in a Machine Learning Competition. My friend, Gora and I won an Azure Machine Learning Competition a couple months ago, so we dug in and got the base of a fairly complex model going right away. Unfortunately, the competition was only 45 minutes long, so we ended up with what could have been a great Machine Learning Model whose potential never saw the light of day. We then checked out the Women in Tech event with some of our new friends and got interviewed by Sit With Me. We made our way to GameWorks and played with unlimited arcade credits for the rest of the night. After it closed, we gathered a group of approximately 30 students for a trip to Molly Moon’s Homemade Ice Cream. I think it’s hilarious that we kept blocking off multiple sidewalks because of how many of us wanted ice cream. After some great chats and ice cream, we headed back to the hotel. Just as we were about to enter the elevator, another student, who we later on became super great friends with, asked if we wanted to hang out at the lobby. Not to make you jealous, but there may or may not have been a little free styling session, and a minor freak out over the fact that we were using Premium Hotel Wi-Fi instead of the free one. We ended up chatting with a little group of people and called it a night when the clock finally struck 12. We woke up slightly later on day 2 and started the day with another incredible keynote. The HoloLens team announced that they were working with Cirque du Soleil to create Mixed Reality stage planning. My mind was completely blown as we headed back to the Hub and checked out some more talks and booths. We ended up getting so much free swag (including a Surface Dial and fidget spinner), things were falling out of our bags left and right. That was the indication that we’ve had a successful conference day. We put down our stuff at the hotel and took the free shuttle to go to the CenturyLink Field for the after-party. The entire stadium was packed with free food. My favourite was definitely Beecher’s Mac & Cheese. We had so much fun at the photo booths that time flew right by us. We almost missed the last shuttle! We ended up going to one of our friend’s room and we all spent the night dancing and playing charades. At one point, we tried to fool a bunch of Americans that us Canadians dance with our fingers instead of body. I doubt any of them actually believed it, but the best part was that everyone played along. We had the MSP summit on the last conference day. All the students from all over the world were gathered again, and lots of people shared what they learnt from the conference with a very supportive crowd. They also gave out awards and turns out I won the Top Microsoft Student Technical Contributor of the year?!??! I was so surprised that the work that I have been doing has been recognized, by more than just a pat on the back by my parents. We gave the student scholarship coordinators our million thanks and headed on a tour of the Microsoft Headquarters in Redmond. The campus was huge. Touring the campus alone made us so hungry, we Ubered straight to the Cheesecake Factory after. We then spent our last night in our friend’s room watching the new season of Silicon Valley together until 3am. I guess that’s what happens when you put a bunch of computer geeks in one room. We checked out the Starbucks Reserve Roastery the next morning and headed to lunch with our little group of friends. I cried when we hugged each other goodbye. Thankfully, Sabrina and I still had a bit of time left in Seattle, so we checked out the Public Market and the rest of Downtown Seattle together. We then went to the airport early and had to bid our farewells. It was sad but sure enough, we’ll see each other again- whether it be in North Carolina, Seattle or Toronto. Now, here I am sitting at a coffee shop ending the blog post about one of the best experiences in my life. Thank you for the incredible opportunity, Microsoft and I hope to be back again next year! My super duper cool sister (I’m serious, she’s really cool) got an invitation to the VRTL Summit at Paramount Studios in Los Angeles and guess who she brought? MEEEEEEEE (I didn’t get to go to the summit because apparently I wasn’t VIP enough, but I got to go to Hollywood, so I’m not complaining)! I was a bit hesitant at first as I bought my plane tickets 8 hours before we were supposed to leave for the airport, but me being me, I just went along with it. On the first day, we went to Urth Caffé for lunch, checked out KoreaTown, the Walk of Fame, brought some snacks back to the hotel and watched (what we call) "trashy tv shows". We called it a night as we prepared for Universal Studios the next morning. We went to Universals on the perfect day. The weather was great but most importantly, there wasn’t more than a 5 minute line up for any ride, which meant that we went on everything. As predicted, The Wizarding World of Harry Potter was the most magical place ever. We bought butter beer and ate at the Three Broomsticks. However, the best part must have been Harry Potter and the Forbidden Journey. I used to be very certain that my favourite amusement park ride is Space Mountain from Disneyland but I have to admit, after the Forbidden Journey, I’m not so sure anymore. The transition between the real ride and the simulation parts were so seamless, it’s hard to remember that in reality, you are a sad and boring muggle (you, not me). WaterWorld was a phenomenal production. Please go if you ever drop by Universals because that show itself will get your money’s worth, I promise! Lastly, I loved the Studio Tour. Don’t get me wrong, the tour was fantastic, but my favourite part was the girl next to me. She was so bored throughout the entire ride, but the second we caught a glimpse of Wisteria Lane (the street from Desperate Housewives), she SCREAMED and took approximately 2.4 million pictures on her phone. I take it back, THIS is what made my money’s worth. We ended up eating Voodoo Doughnuts and pizza for dinner. Sorry mom. That summed up my trip to L.A. It was so much fun, especially since I started my internship a couple days after coming back, so the timing was perfect!